The film turns the real-life machinations of Stalin’s subordinates into an uproarious, political spoof. And its timing couldn't be better. Duchovny’s comments came back to me while watching Armando Iannucci’s "The Death of Stalin," a film about the power struggle in the Soviet Union in the immediate aftermath of the brutal leader’s death. A remarkable, dark comedy, it turns the real-life machinations of Stalin’s subordinates into an uproarious, political spoof through some of the more biting satire in recent memory. And the timing is impeccable: Today’s news seems stranger — and less funny — than ever. “Humor is a very strong force for dealing with people who have gone power mad," Palin told me. "It's the one thing that they can't really deal with; they can deal with any kind of opposition, but being laughed at they really don't like." 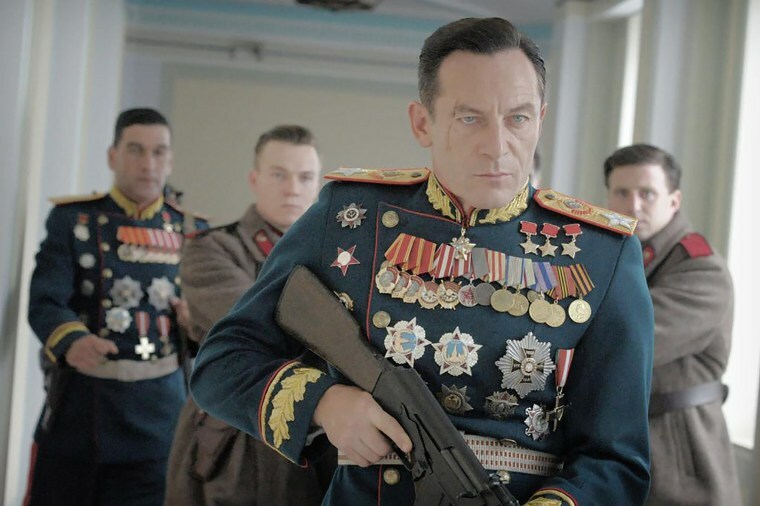 "The Death of Stalin" is a comedy, but it has a sharp edge to it as well. “People have said to me, ‘It was so vile, I couldn't laugh at these killers. I had to walk out,’” Palin says. “I think that’s very interesting, considering the absurd times we’re living in." It’s true that Stalin and company — Molotov, Nikita Khrushchev, Lavrentiy Beria, Georgy Malenkov, Nikolai Bulganin — were brutal beyond all measure. But as the film shows, via the almost unbelievable real-life events that transpired in the wake of Stalin’s stroke and death, they were also power-hungry, egotistical, greedy, narcissistic and incompetent. And yet, the world really is shifting. In the context of Trump’s chaotic first 14 months in office — not to mention the ever-present questions about Russian meddling — the film has taken on new meaning, especially in America. “When you watch these, shall we generously say, fallible characters, it’s meant to remind us never to believe anything that we’re told,” Isaacs notes. “We all need to remember that our leaders are essentially maniacs and trivia obsessed narcissists. So as we watch everything that’s happening now in this country, or England, or wherever, it’s good to think of it through the prism of that understanding, remembering that satire has been a political tool forever. Even in the time of Stalin — even though they were terrified of being killed — they were circulating joke books to stay sane. And when you watch the film, no matter how outlandish the things that happen seem, everything that happens in this film is true." To be sure, "The Death of Stalin" is a wild 107 minutes. But the chaos and violence and ridiculousness of it all never feels inauthentic. Just be prepared to wince as often as you laugh — especially when trying to match the 1950s Soviet minister with his current Trump cabinet doppelganger. Especially for Americans, "The Death of Stalin" may be the perfect antidote for the avalanche of sewage spewing every day from our computers and phones. “Armando has calibrated the tone of the film so you're laughing with the characters out of terror and out of discomfort,” Isaacs says. “This administration is incredibly strange, but it's not the first time this has happened, and it won't be the last. Still, especially for Americans, "The Death of Stalin" may be the perfect antidote for the avalanche of sewage spewing every day from our computers and phones. Like this movie, though, ignoring the problem won’t make it go away. You can’t dismiss Trump, nor can you pretend that his interactions with world leaders don’t have potentially catastrophic consequences. The only silver lining from the movie may be the idea that life, eventually, does go on. True to the fearless bluster of his character, Isaacs is trying to keep things in perspective.